spring fling vegas april 16-20 2019 K&N SPRING FLING MILLION - TUESDAY RESULTS With a potential of a $1,000,000 payday to one lucky racer, racers from all over the country including Mexico and Canada, flocked to The Strip at Las Vegas Motor Speedway with the hopes of being that one fortunate person at the K&N Spring Fling Million presented by Optima Batteries. The gates opened yesterday and by the time they closed at 9:00 last night, over 500 entries rolled through the gate to take part in the week's festivities. Three separate $30,000-to-win races bookend Friday's Spring Fling Million race. Typically, a lot of people will enter the auxiliary races with hopes of earning enough money to enter the separate Million with its progressive payout that guarantees $250,000 to the winner regardless of car count. The payout increases according to the entry count with only 475 entries required to pay the full $1,000,000. "Judging from the number of cars we have on the property as of today," says co-promoter Peter Biondo, "the Million will definitely be our biggest Million Dollar race since we began that type of payout four years ago." Today's schedule called for a free Test & Tune session sponsored by FST Carbs. 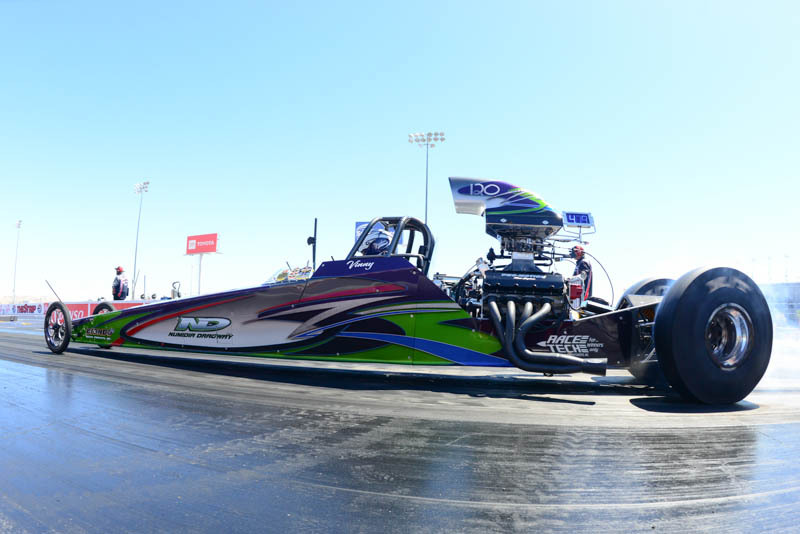 In addition, a limited 48-car field raced for a brand-new American Race Cars dragster complete with Brando Custom Paint worth $40,000. However, what is not typical for the Las Vegas race is the uncertainty of weather. For a city which boast 122 casinos and therefore keeping a great majority of its visitors indoors, Las Vegas claims an average of 294 days of sunshine each year. 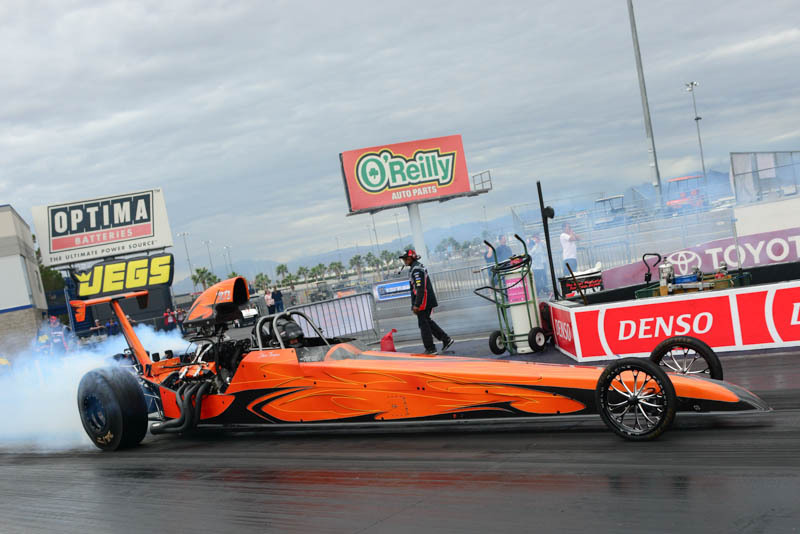 Today began with bright sunshine but turned wet before the first round of the Dragster Shootout eliminations. Several hours of wet followed by attention from the staff at LVMS brought the track back in shape and by 6:45, we were underway once again with time trials and eliminations. 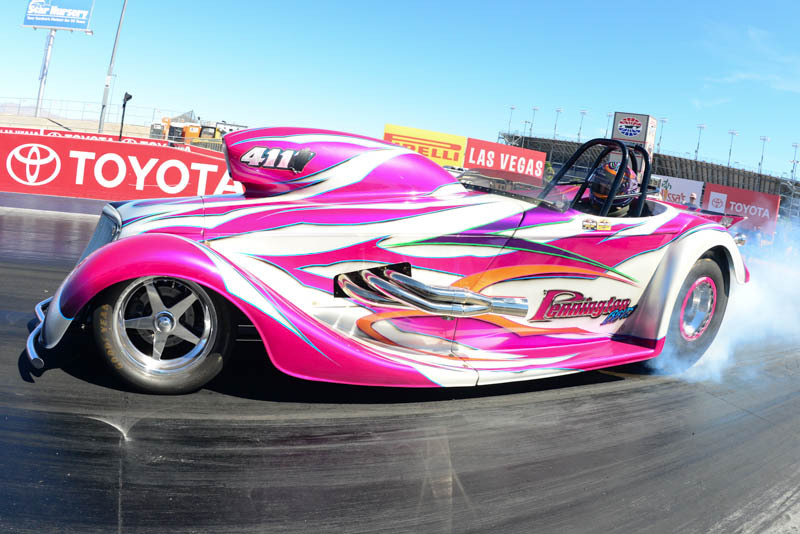 After the second round of the American Race Cars and Brando Custom Paint Dragster Shootout, falling temperatures; another thing which isn't typical for Las Vegas in April; forced officials to postpone eliminations until Wednesday morning. The remaining 12 racers will be paired on a ladder in the morning; of which the weatherman has assured will be a much better day. With support from JEGS and Hoosier Tires, all of the action is streamed live on BangShift.com. For more info and results, you can always visit www.bracketraces.com and on Facebook. K&N SPRING FLING MILLION - WEDNESDAY RESULTS Sunshine and warmer temperatures greeted racers today at The Strip at Las Vegas Motor Speedway for the Maytag/Silverstate Refrigeration Wednesday of the K&N Spring Fling Million presented by Optima Batteries. The plan for today was a single time trial for new entries only followed by eliminations for the Maytag $30,000-to-win day. However, first up was the American Race Cars/Brando Custom Paint Dragster Shootout to finish their eliminations leftover from Tuesday night. In that semifinal round, the importance of a good reaction time was pretty evident when Williams left with a .004 reaction time to Thompson's .030, leaving Thompson on the outside when it came to the finish line. For his bye run, Burns left the line with a red-light which gave Williams lane choice for the final round. And in that final, Williams left first by virtue of his 4.66 dial-in with a .005 reaction time, but Burns' .012 and dead-on the dial with "3" was enough to reward him with a new race car to take home to Tennessee. 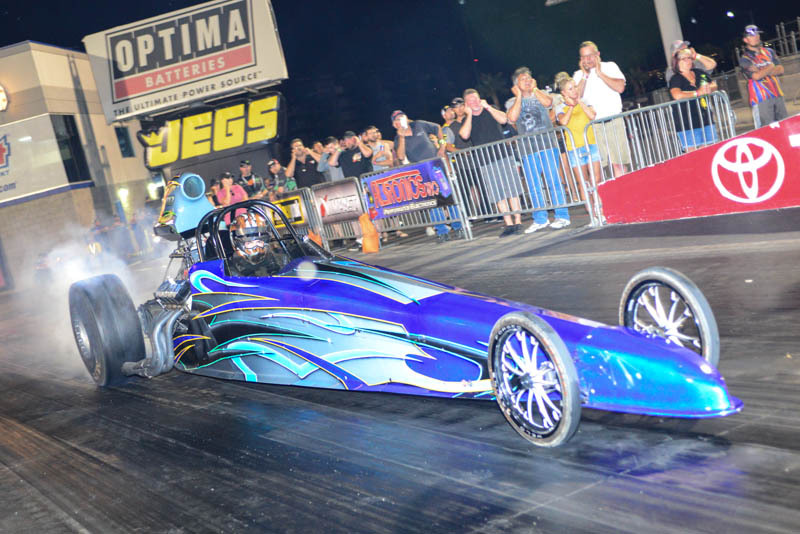 Eliminations for Maytag Wednesday's main event then began at roughly 10:00 in the morning and by the time the first round was complete at around 2:50 in the afternoon, 562 entries had competed in the first round. "We are so thankful for all our customers who had the faith in us to put on a great event," said co-promoter Kyle Seipel. "This is our biggest event since we began here in Vegas seven years ago. We're so excited in that as of today, we are on line to have the largest payout ever for Friday's main Million race." For a man who has a number of Spring Fling trophies to his credit and had been killing the 'Tree all day, Labbous dropped it red by -.004 in the final to hand the trophy to the man from Knickerbocker, Texas. "So unbelievable," said Thorp. "I was good when I had to be good and lucky when I needed to be lucky." Bangshift.com is continuing to stream all the action from the very first run down the track to the very last each day thanks to support from Hoosier Tires and JEGS. For more info and results, you can always visit www.bracketraces.com and on Facebook. K&N SPRING FLING MILLION - THURSDAY RESULTS There was price on Kevin Thorp's head after his win last night in the Maytag/Silverstate Refrigeration Wednesday portion of the K&N Spring Fling Million presented by Optima Batteries. The person who beat him in any round of eliminations today earned themselves a Racepak Sportsman Data Logger. That person ended up being Dane Ward who took out Thorp in the very first round. It was four years ago when co-promoters Pete Biondo and Kyle Seipel instituted a Pro38 footbrake class to the line-up in the Spring Fling Million. The select group of footbrake racers race each other until a winner is crowned, after which that person advances to the sixth round of the Super Pro class in addition to receiving a $500 bonus over and above whatever round money they earned. 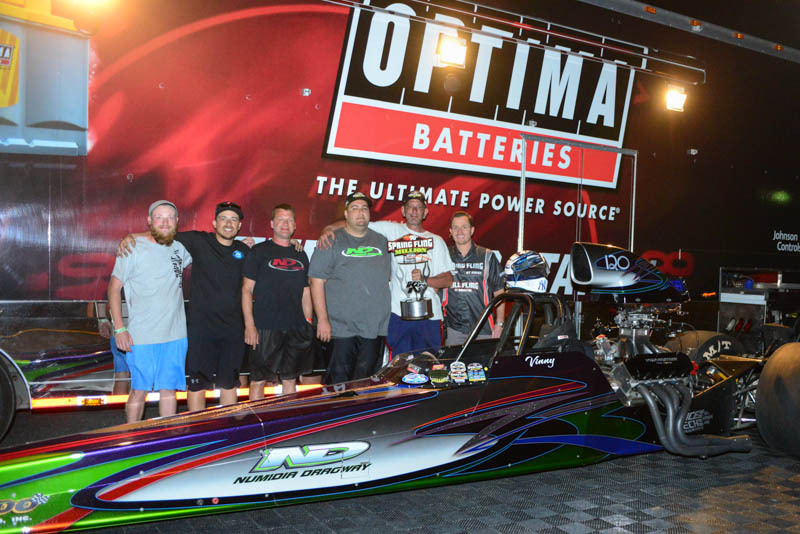 Last night's Pro38 winner was two-time NHRA Stock Eliminator champ Brad Burton who advanced to the quarterfinal round against a sea of delay box racers. Tonight's Pro38 winner was many-time big money race winner "Nasty Nick" Hastings who dispatched another heavy hitter in Ryan Mangus with a .019 package for the win. Transferring into the semifinals with wins in round eight were Ezell, Larson and of course Labbous on the bye run. For the semis, Ezell will advance into the final with the bye run based on his .006 reaction time and dead-on the dial with a "0". K&N SPRING FLING MILLION DOLLAR RESULTS The day arrived. Maytag/Silverstate Refrigeration Million Dollar Friday, the main event of the K&N Spring Fling Million presented by Optima Batteries. A day which will certainly change the life of one person. This being Vegas, what better "casino" to place a bet than The Strip at Las Vegas Motor Speedway and first up today was the Brodix Run For The $50,000. For a $50 "bet," place a dial-in on your car, "pull the handle," leave the starting line with a perfect .000 reaction time and run dead-on your dial with a "0" gets you a perfect run and a $50,000 check. If no perfect runs are recorded, the best package earns that driver a set of Brodix SR20 cylinder heads. Second place gets a $2,000 check and third place a free entry into the 2020 Spring Fling Million main event. If no one hits the $50K perfect run, the first perfect run in Friday's elimination will earn that driver $20,000. No perfect runs but Sean Page used a two-thousandths package to take home the set of Brodix cylinder heads. Cassie Pennington and Wes Anderson tied for second with a "five-pack" to respectively take home $2,000 in cash and a free 2020 Spring Fling Million Friday entry. And so began the first round of eliminations for the main event, the one everyone wants to win, Million Dollar Friday. When the first round was complete almost three hours after it began, 344 entries had taken their shot at the win. 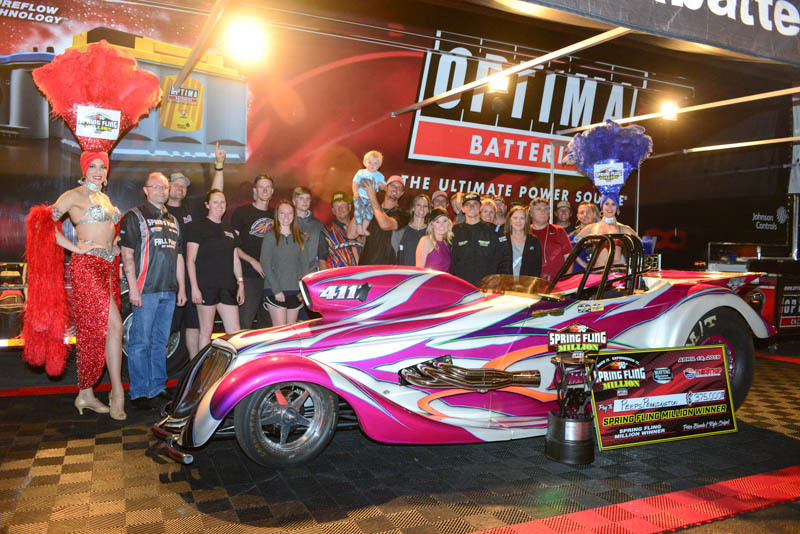 According to the progressive winner's share, someone was going to walk home at the end of the night with a $375,000 check, possibly the largest amount of money paid to date for the win of any single drag race, regardless of class. Because no one hit the Run For The $50K, co-promoters Kyle Seipel and Peter Biondo chose to roll $20,000 over to the first person who lays down a perfect run in Friday's eliminations, which never occurred, albeit still an admirable effort and the reason so many racers like the Spring Fling brand of races. Four cars and four tough competitors. First up was Carr and Northrop, with Carr using a .003 reaction time to Northrop's .022 for the win. Next up were the two remaining "door cars," Pennington and Schmall with Pennington taking the win while Schmall ran .004 under his dial. 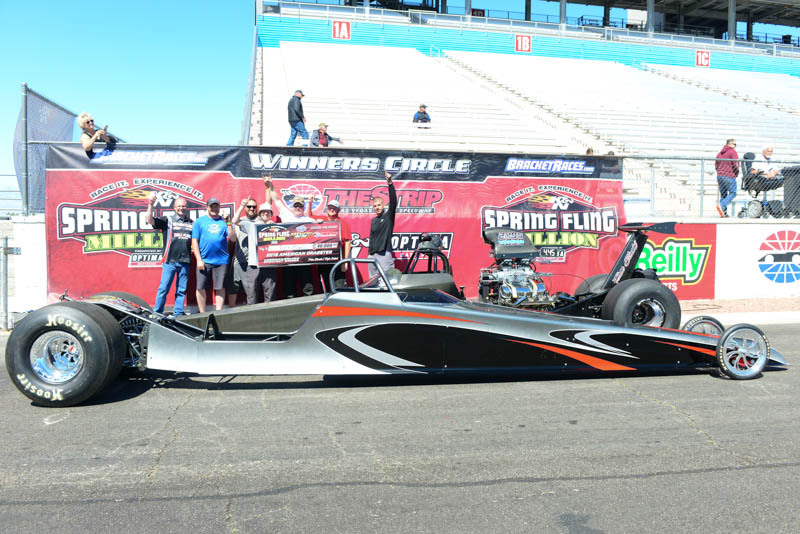 And with that, the final was set with former Vegas Fling winner Pennington looking for his second Fling trophy, while Carr, driving Shane Thompson's 4.4-second car at this race, has won at just about every big money race all across the country. 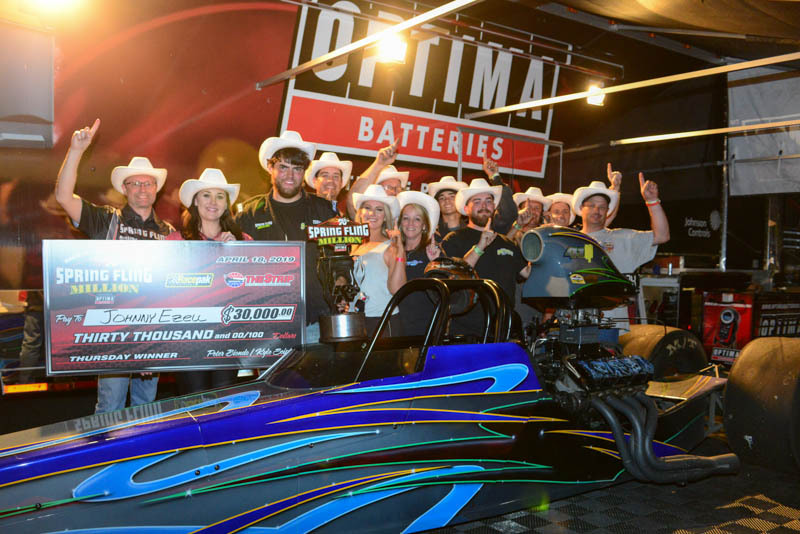 In the final, Pennington had the reaction time advantage and held on for the win to add his name to an impressive list of Million Dollar race winners, earning a record amount of money for his efforts, taking it all the way back to Three Rivers, Texas. The one question he asked after the final? "Can I still race tomorrow on the last day?" Not a good idea. But he'll be enjoying a two-night stay at the Cosmopolitan Resort as part of his winnings. Chad Reynolds and his Bangshift.com staff have streamed all of the action live as it happens thanks to support from Hoosier Tires and JEGS. Visit www.bracketraces.com for info and results. K&N SPRING FLING MILLION FINAL DAY RESULTS Day last of the K&N Spring Fling Million presented by Optima Batteries has come. Five days of racing, over 5,000 runs down the track, countless thousands of dollars given away and it all came to a close today with one more day of eliminations in a $30,000-to-win, FTI Saturday. "We are so overwhelmed with the support we received from each and every racer that had the confidence in us that we would give them everything they asked for and more," said co-promoter Peter Biondo. "There aren't enough thank yous we could offer to show our appreciation. Myself, my wife Emily and my partner Kyle Seipel are so honored by the presence of each racer, crew, family and fans. We had a blast this week and can't wait to do it all again next year." First up today was the Reaction Time Challenge for 25 randomly picked racers to take a shot at either a double "0" or perfect triple "0" reaction time. Any .00X earned the driver a crisp $100 bill, with a perfect light ten crisp $100 bills. No one was able to score that perfect .000, but five racers walked away with a piece of paper with a photo of Ben Franklin. 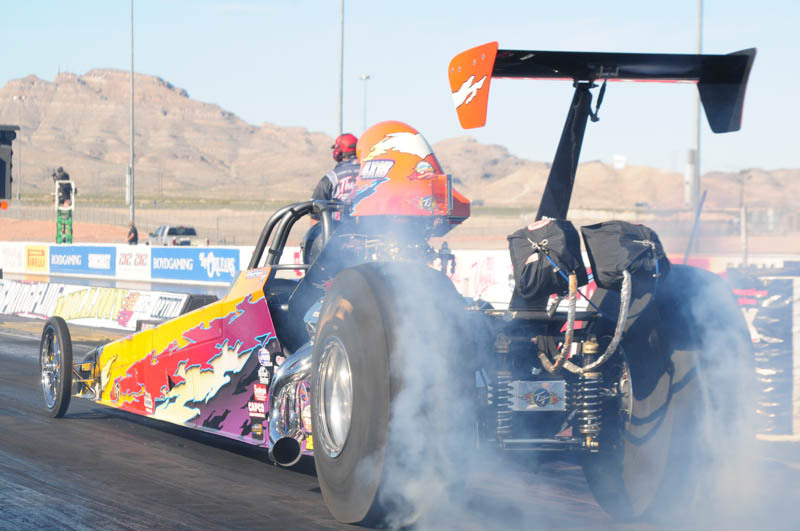 Survivors of round seven were Labbous in Anthony Bertozzi's Super Gas car, the lone remaining door car, with Labbous already having a runner-up and semifinal appearance this week; former Vegas Fling winner Dimino; Burleson; and NHRA national event winner Dye. In that semi, Carter had a .042 reaction time while DiMino left with an .015, a deficit Carter couldn't make up, advancing DiMino to face Labbous in a battle of former Fling winners. It was the 2018 version of this same event when Vinny DiMino seemingly couldn't get out of his own way let alone win a round of racing. But by the final day, Saturday, he turned on ten win lights to take the trophy back to New York with him. Flash forward one year, and as he said, "I was really getting beat up all weekend here. But whatever it was, we turned it around for the win." As the box score shows, Labbous dropped it red in the final with DiMino scoring a .016 reaction time and a dead-on the dial with a "4" for the win. 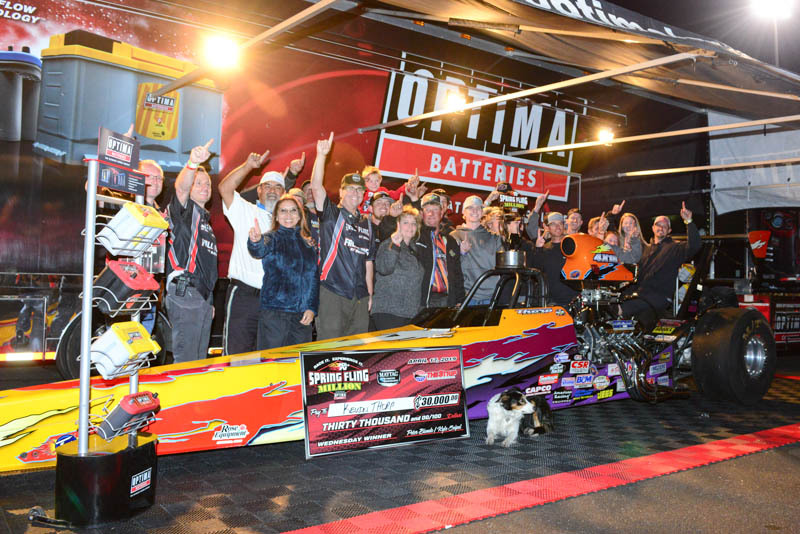 Our sincere congratulations go out to each of the winners, Tuesday's Dragster Shootout winner Jeff Burns; Maytag Wednesday's Kevin Thorp; Racepak Thursday's Johnny Ezell; Maytag Friday's Million Dollar winner Peeps Pennington; and of course, today's FTI Saturday winner Vinny DiMino. Click here to view the 2018 Spring Fling Million Race Results.